L Ballesteros-Aguayo, FJ Escobar-Borrego (2019): “Humour in the post-war press: Short stories of Gloria Fuertes in the falangist magazine Maravillas”. Revista Latina de Comunicación Social, 74, pp. 521 to 536. The Spanish civil war entailed an impasse in the development of press as a communication platform. In fact, its instrumentalization for propaganda purposes explains its role in the consolidation of the new State. So, in the newspaper network created around the Movimiento Nacional (National Movement), the children’s press occupied a predominant place due to its contribution to the education of future generations. So much so, that the strategical-ideological aims imposed by the regime coexisted in these platforms together with the collaboration of artists of prominent aesthetical level. Such is the case of Gloria Fuertes (1917-1998), who gave life in the magazine Maravillas, to very popular characters such as Coleta and Pelines to disseminate their short stories once more, back in the eighties, in three monographic books: Coleta, la poeta (1982), Coleta, payasa ¿qué pasa? (1983) and Pelines (1986). However, such protagonists, beyond constituting aesthetical projections of the writer as heteronyms, would end up becoming authentic icons of children’s imagery. 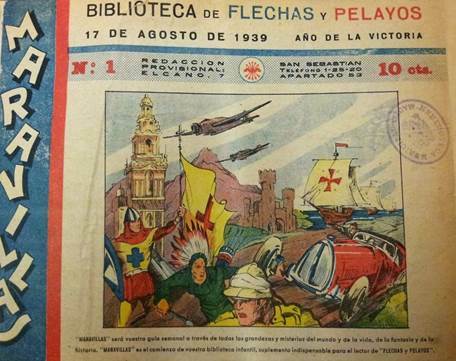 In this paper, we present an analytical study of the children’s magazine Maravillas as the only journalistic initiative, together with Flechas y Pelayos, that the Francoism destined to the education of young children during the post-war years. However, the participation on these platforms of such incomparable authors like Gloria Fuertes, one of the renowned writers of children’s literature , or the illustrator Cristino Soravilla, among others, increased the artistic relevance of the magazines published back then with the priority objective of educating the youngest children according to the Falangist ideological prism . Now, the complex changes and difficulties of the post-war, as a period of complete instability due to the social, political and economic crisis of the moment and, as a consequence of the impact produced by the establishment of an authoritarian government, ratify the need for theoretical-scientific interdisciplinary approaches that allow to contextualize, in the most accurate way possible, the performance of communicational processes in the social sphere and, therefore, in the evolutionary development of society, as well as in the institutionalization of press. About this specific subject, it is worth mentioning that the definition of post-war journalism as social activity is indissoluble from its historic-cultural analysis, namely it is indispensable to confront it with a wider framework of institutions, techniques, practices, etc. interrelated in time and space. Therefore, the contextual consideration heads in two directions: on the one hand, towards the observation of communication as a productive system, integrated in the structures and socioeconomic relationships and, on the other, towards its conception as specific socio-semiotic space where literary and pictorial symbols combine in such a way, that they produce a specific meaning . In this polyhedral interdisciplinary context, the sociocultural, political and journalistic relevance of the communicational interaction justifies, all in all, our interest for the analysis of the aesthetical production of Gloria Fuertes, one of the main collaborators in Maravillas , which is the only official publication targeted to the children of the post-war, and its consequences in the collective imagery in our country’s communication system and in the subsequent journalistic creations . This is the reason of the convenience of a research circumscribed to the theoretical-methodological review of the most relevant aspects of this kind of communication and the relationship established among its actant actors. In addition, there also adds the use of printed media for the dissemination of a specific Francoist and Catholic value system. However, said political-religious utilitarianism is explained due to different reasons, among which there are, naturally, the sustainment of the status quo consolidated after the civil war and the extension of the power of the Church, considered one of the cardinal guarantors of dictatorship. Precisely, the presence of a group of values emerging in a recurrent manner in these hybrid platforms between writing and image, in other words, literary painting as Gloria Fuertes would say , produces the homogenization of themes and the ideologization of these productions, thus contributing to a progressive configuration of the public agenda . Other than that, special attention was given to the propaganda elements, such as slogans or mass events where the leader and authoritarian system are extolled, considering that it constituted one of the fundamental pieces of the political-communicational strategy. In fact, in the case of the Francoist Spain, the teaching of the hymn composition Cara al sol at schools, the psalmodical repetition of exaltation songs of patriotic feelings, the ritual reiteration of greetings and cheers in relation to the figure el caudillo (leader), the rescue of the imperial past with symbolic-allegorical allusions to traditions, conquers and territories invaded in past times and the imitative reproduction of slogans like ¡Una, grande y libre! (One, grand and free!) are one of the clearest exponents of totalitarian regimes, while composing common elements, between the voice and the word, together with Mussolini’s Italy and Hitler’s Germany . In short, there is unanimous consensus by critical authors of the first studies that approach the analysis of this press of interdisciplinary relevance in assessing the journalistic medium as a fundamental element in the configuration of childhood and youth, since it is considered a mechanism of noticeable transcendence in the constitution of society of Francoist ideology. In this regard, Vázquez warns, all in all, about the suitability of offering younger children an educational reading of quality that could be useful to cultivate their literary and pictorial hobbies . Regarding the scientific need of attending the critical gap mentioned in the state of the art, as it has been happening with Gloria Fuertes, the social projection reached by the study of this press is justified by the demand of the contemporary society to delve into the institutional forms of mediation stablished during the first years of dictatorship. Likewise, with this participation of interdisciplinary nature there is contribution for the recovery of a gained artistic-literary tradition, represented here by the author from Madrid, that is part of our culture while it contributes to explaining the course of history of our country. A proof of this is, in fact, the task performed by representative figures of the contemporary Spanish literature, who initiated their trajectory by collaborating in these magazines and that currently are considered indispensable in our culture. In addition to the case that concerns us here, it is a must to recall the famous names of Montserrat del Amo, Federico Ribas, Álvaro de Laiglesia, Castanys and Penagos. In other words, said authors fostered in these publications, the literary reproduction of interdisciplinary scope, generally, and the aesthetical taste of the journalistic expression, undoubtedly a relevant aspect for the literary patrimony of our country and where there has barely been any deepening about it despite the visible transcendence it treasures from the social and artistic-cultural perspective . Along with them, there were also many fictional characters that became authentic icons of the popular culture, as well as the children and youth world . This happens with the Mari-Pepa’s short stories, edited by Emilia Cotarelo and with illustrations of María Claret, or the mentioned Coleta by Gloria Fuertes, illustrated by Cristino Soravilla. Indeed, the figure of our author gets a special interest about this matter, advocated lately from the contemporary canon and literary historiography, mostly due to the centenary of her death . Versatile and fertile author, provided of literary qualities associated to fantasy, humour and verbal sharpness, between surrealism and postism , she collaborated assiduously with several post-war children’s magazines, among them Chicos, Chicas and Chiquitito, coordinated by Consuelo Gil and with illustrations of Antonio Mingote . In addition to these contributions, there are her publications in Falangist platforms like Flechas y Pelayos or, naturally, Maravillas . 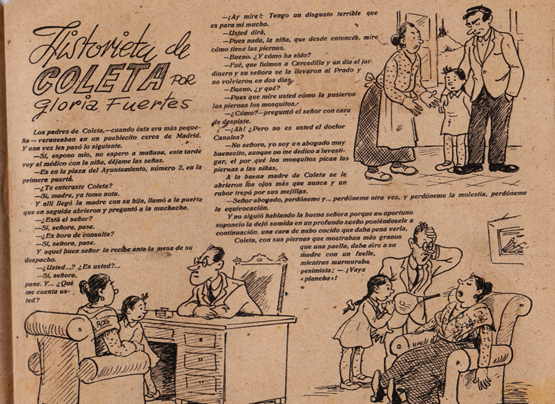 The later, particularly, destined a periodical section to Fuertes collaborations like “Historia de Coleta” (Story of Coleta) or “Pelines” (Figure 1). 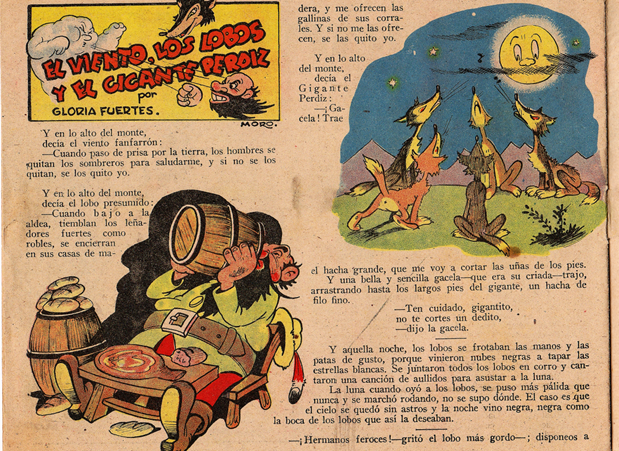 Likewise, other creations of narrative nature were incorporated to these fiction characters, like “Fiesta del mar” (Sea Party) or “El viento, los lobos y el gigante perdiz” (The wind, the wolves and the Giant Partridge), illustrated by Soravilla, in the case of Coleta as mentioned earlier or, Titos, in the case of Pelines. In brief, with this paper we want to grant value to the collaborations of Gloria Fuertes in the context of the journalism of creation, first published by the supplement Maravillas between 1939 and 1945, as initial seed for the subsequent aesthetical evolution of the writer, with a noticeable calling for the interdisciplinary management between literature and painting. In relation to this pristine protohistory, two years are especially relevant: 1939, because there is the start of the blue period of the regime  and also because the publication starts to be edited as the children’s supplement Flechas y Pelayos; and 1945, date when the Falangist monopoly about the children’s press ended, at the same time the platforms of the unique party acquired a different orientation on the occasion of the events happening in the international sphere after the decline of the II World War. nº 800, 7 June 1945, p. 5. 1) To assess the determining factors of ideological-doctrinal nature of this literary press by the State entities for the dissemination of specific ideological-moral values. 2) To achieve a better comprehension of this historical period considering the analysis of the journalistic-literary phenomenon. 3) To assess the social, political and cultural transcendence of the journalistic-literary practice and the socializing function of said activity from an interdisciplinary approach in a code intersection between literature and fine arts. 4) To emphasize the relevance and persistence in the aesthetical universe of Gloria Fuertes, of this stage of journalism of creation, linked to the periodical and serial section of Maravillas, and its two most renowned children protagonists, namely Coleta and Pelines, revitalized by the author in the decade of the eighties. The instrumentalization of media by the Francoism was always linked, in the case of younger children, to the educational nature of press. This way, the presence of the Catholic doctrine in the educational mission of the Francoist State manifested both at school as well as in the journalistic discourse . In fact, this doctrinal character of press was due, to a considerable extent, to its channelling thanks to the newspapers network of the Movimiento Nacional (National Movement), one of the most noticeable editorial groups of Spain . This is how the so-called press of the Movement was configured, with the proclamation of the Law dated 13 July 1940 which established the incorporation of the newspapers seized by the Ministry of the Interior “To the Patrimony of the National Press and Propaganda Service of the Falange Española Tradicionalista y de las JONS (“Traditionalist Spanish Phalanx of the Juntas of the National Syndicalist Offensive”) . In addition, other facts of interest in the journalistic field where the founding of the Frente de Juventudes (Youth Front) as a result of the law dated 6 December 1940, the decree of 24 February 1942 that regulated the license of authorizations for press and the decree of 4 May 1941 that implanted the exemption of censorship for the newspapers of the Falange . However, said press network entailed, all in all, a series of State advantages compared to the rest of publications. Thus, it was granted special paper quotas while those of Falange’s were exempted from censorship and those of the Church had a more relaxed regulation. It even enjoyed a wide spreading throughout the country considering the newspaper networks of Falange that facilitated its distribution by using the delegations of the unique party. In any case, this aspect is really relevant if we consider the progressive detriment of the transport network as well as the business fabric after the civil contend, hence hindering the sales and dissemination of products throughout the country . Regarding the newspapers of national-unionist ideology, the weekly publication Flechas y Pelayos gained special awareness, which started to be published on 11 December 1938 , not only due to its noteworthiness in the field of press for children and youth but also due to its transcendence in the post-war political sphere. Later, and as a result of the need for diversifying the journalistic offer, its supplement Maravillas, was forged from a preeminent vantage point, targeted to minor readers up to ten years old and where there participated, part of the staff of collaborators from the masthead. Therefore, and despite this difference, both publications served as prototype of the magazine of FET y de las JONS, becoming the only two children and youth’s weekly publications edited by the unique party until 1945, at the same time they fulfilled the main objective of serving as mechanisms for conveying the propaganda discourse . All in all, this explains the fact they established as essential models for subsequent publications, therefore their journalistic, political and economic standards, as well as their influence in the communication strategy of the regime, extended beyond the forties. It is difficult to rectify in glass, aquarelle or love. In compliance with the contextual framework profiled so far, it is worth mentioning that, with the publication of its first number on 17 August 1939, Maravillas initiated a dilated trajectory that elapsed concurrently to Flechas y Pelayos. However, both dissemination courses represented, as indicated, two of the best paradigms of the propaganda scheme that boosted the Francoist State during post-war (Figure 2). of Flechas y Pelayos, nº 1, 17 August 1939, p. 1. Now, the inaugural number of the publication incorporated the subtitle Library of Flechas y Pelayos while on its cover its affiliation to FET y de las JONS was indicated. 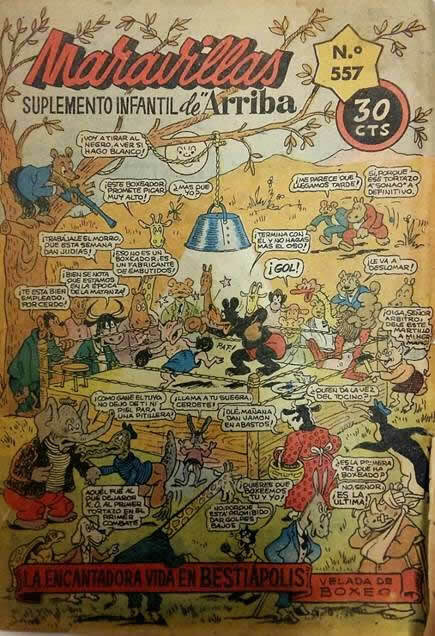 In fact, since it was targeted to children under ten years old, the publication was born with a weekly basis  while, like Flechas y Pelayos, the management was done by Justo Pérez de Urbel, working Avelino Aróztegui as chief-editor. Other than this, the printing was done in the Talleres Offset of San Sebastián while it was distributed through subscription in Spain with a price ranging from ten cents on 24 August 1939 until the number 89, at the end of May, when it increased twenty cents. In brief, with variable dimensions, the first edition presented a format of 21 x 17 cm., and a pagination about sixteen non-numbered pages. Nevertheless, the publication suffered transformations and changes across its hazardous existence, changing the name to Suplemento Escolar de la revista Mandos (School Supplement of the ‘Mandos’ Magazine) after number 357, dated 7 October 1945, and becoming a Sunday supplement of the national newspaper Arriba (Figure 3) . third period, nº 557, January 1951, p. 1. Furthermore, with the onset of this new period the select cast of collaborators widened. Thus, those who already came from Flechas y Pelayos such as Pérez de Urbel, fully dedicated to the historical and patriot contents, and Emilia Cotarelo, also other names of reference from back then joined in like Alfredo Ibarra, Huete, José Antonio Laiglesia, Villarejo, Estelita, Rita, Carmelo, Cañada, Moro, Emi, Pena, Fernández Vege, Matilde Ras, Vigil, Escudero, Ventas or Rubio, who contributed to the enrichment of the newspaper, considered as floruit, the number 507 published on January 1951. So, in this cultural context of journalism of creation, of the most popular literary characters among children was Coleta by Gloria Fuertes, which creation incorporated the aforementioned illustrations by Soravilla. In fact, through a task of interdisciplinary cooperation , the different productions of both authors granted an innovative and interdisciplinary character to the supplement contents, In order to do this, the use of subtle humour and satiric style irony both in the literary text as well as the images, like a sort of ekphrasis, turned out to be crucial , since they entailed, all in all, a marked aesthetical distancing from the moral-style story that ruled in Flechas y Pelayos. Furthermore, from the same interdisciplinary prism, the writer from Madrid also collaborated with other outstanding artists of the time, especially with Moro, who illustrated stories like “El viento, los lobos y el gigante perdiz” (The Wind, the wolves and the Partridge) published on 1945 (Figure 4). by Moro. Maravillas, nº 297, 17 May 1945, p. 1. Where? Where are the children? As indicated often by Gloria Fuertes, her aesthetic production, both in prose and verse, is presided by autobiographical keys . Therefore, it is not strange that the two children protagonists of Maravillas, the orphans Coleta and Pelines, become heteronyms, a sort of alter ego, of the writer, considered to some extent by her own friend as a “big girl”, namely the orphan girl Glorita, with resonances in her poems such as “Antiguo ejercicio de redacción de Glorita” (Old writing exercise of Glorita) . Indeed, Fuertes, who resolved in her literary painting of Maravillas that children could think, with reflective criteria, about matters close to their universe of learning and also to those of adults, she refers to her orphan condition in “Autobio” (“When I was little, I wanted to be an orphan / because my parents did not love me.”) . In any case, Coleta and Pelines, as bibliographic projections of the writer and her self-ist or glorist literature, appear very united in tone of friendship, as shown in “Pelines y su amiga Coleta” (Pelines and his friend, Coleta) . In other words, in the end, we are standing before two facets of the writer’s profile, in such a way that the former is characterized as a rebel, transgressor and subversive child while his friend is specially a dreamer, polyvalent artist and interdisciplinary creative. Now, against the light of these biographic notes coming from Maravillas and identifiable in her work in the fifties until the end of the seventies, thus in her Canciones para niños (Children’s songs) but also for “older people” in compositions such as “Es inútil” (It’s useless), referring to the doll Mariquita Pérez or “verde muñeco azucarado indesnudable” (non-undressable green candy doll) in “Pirulí”, in Obras incompletas (Incomplete works) , and even in the verses “Será esto que sabéis que me pasa” (Is this what you know is happening to me) recalling that she never had a doll in her hands while she was a girl, included in Historia de Gloria (amor, humor y desamor) [Gloria’s Story (love, humour and heartbreak) , Fuertes preferred to disseminate her interdisciplinary creative aspect, in the early eighties, from another framework of action. In order to do this, she left the path of children’s literature behind, recognizable in Villancicos (Christmas carols)(Madrid, Magisterio Español, 1954) passing through Tres tigres con trigo (Three tigers with wheat)(Madrid, Yubarta, 1979) or her Guiones, cuentos y poesías (Scripts, short stories and poetry)broadcasted by Televisión española, taking, as main models, her two protagonists of greater mediatic success up until then since her phase of Maravillas, namely Coleta and Pelines, well known and recognized by the youngest public. Thus, there are forged, in said decade, two publications of Coleta in book format, specifically Coleta, la poeta (Coleta, the poet) (Valladolid, Miñón, 1982), with illustrations by Ulises Wensell , and one year later, Coleta, payasa ¿qué pasa? (Coleta, clown. What’s the matter?) (Valladolid, Miñón, 1983), a volume also illustrated by that same author and that was reprinted in 1985 . The next year of this re-edition, and considering the good welcoming among the youngest children, there was born, lastly, and following Coleta’s Trail, Pelines (Barcelona, Miñón, 1986). Let’s look at it. In the printed double series dedicated to Coleta, as reflected by representative texts such as “Coleta y el elegante elefante volante” (Coleta and the elegant flying elephant) or “Coleta payasa ¿qué pasa?” (Coleta, clown, what’s the matter? ), among others, Fuertes re-wrote, using a palimpsest exercise, the wide narrative material disseminated in Maravillas, adapting it to the new era and, hence, to the children of the eighties . In contrast, she decided to preserve her recurrent biographic projection, perhaps emphasizing, on the other hand, theme cores closer to the universe of adults. Be it as it may, Coleta, represented as an archetype close to other children’s characters such as Pippi Långstrump or Pippi Calzaslargas (Pippi Longstocking) (1945) by Astrid Lindgren , is depicted as an orphan in these two books, the same as in Maravillas, even though she lives with her grandmother Calixta. Likewise, she shows herself as a fictional reflection of her author, very curious and full of dreams and illusions, but considering her renown nature she becomes, during the eighties, the “¡Coleta de España!” (Spain’s Coleta). In fact, as if she were an actual national star , she is provided, in her characterization, of symbolic attributes such as a trumpet. Thus, it is so when she decides to act to the rhythm of a “joyful haughty pasodoble” among wind and metal sounds, protruding the timbre of the tuba with deep scope and register, composing an original resonant landscape. And all this before the presence of Coleta’s friends, as readers-spectators in the circus-like performance, quite usual in the creative imagery of Fuertes . Furthermore, magic, as we will see, gets especial relevance in this context, in such a way that the laughter of one of these children, a true antidote against the shortage and heartaches of life, turns into a musical rhythmic succession of doves as a sort of transformation or metamorphosis. Now, among Coleta’s friends, Pelines gets an exceptional place. And the fact is that, after the good commercial welcome of the double aesthetic publication of Coleta, Fuertes decided to make him reappear in the editorial arena, as evidenced by the writer in representative texts such as “Este es Pelines” (This is Pelines), by his condition of naughty “little orphan”, in a game of mirrors against Coleta, even though he shows smart, affectionate and with a “beautiful heart”. Apart from that, in a parallel situation in regard to Coleta, he lives in the countryside with his aunt Paca and his grandmother Manuela, while he is accompanied by chickens, hens and a goat, in other words the “Animaland”, so characteristic of Fuertes in her aesthetical production. Whatever the case may be, like Coleta, Pelines shows his imperious need of interacting with good friends, perhaps as sublimation of the lack of affection from his parents. His portrait is presented, all in all, like that of an exemplary hero of the children’s everyday life with passionate vocations, but among steady experimentations of multidisciplinary character and no fewer failures, as evidenced in texts like “Pelines en mayo” (Pelines in May), in a noticeable interest of the protagonist for poetry although also for songs composition, that is ut musica poesis like two favourite vocations of Fuertes. Moreover, although to a lower extent than Coleta, Pelines also shows his fondness for the theatre and performative arts , another devotion among the broad interdisciplinary interests of the author, in such a way that he even wears an angel costume for the school representation, despite the fact he forgets the final part of the story in the end. Lastly, in a noticeably harder experience than the previous one, in “Pelines cazador” (Pelines, hunter), the protagonist debates, as a sort of internal conflict or psychomachia, before the painful doubt of hunting a rabbit. On the other hand, not only he perceives that this is not his vocation but also that, by mistake, he shoots his dog, hence suffering an enormous sorrow. In short, this modulatory arc between the protohistory of Coleta and Pelines gestated in Maravillas and its subsequent formalization with a more perfect finishing touch as a book in the eighties in order to make the most of the public created in the previous periodical publications, maintains, in essence, the characterization of the two characters as a fictional reflection of Fuertes’ personality. However, the two children are orphans and with scarce material resources but granted with an evident creative imagination and rich inner universe. So much so that Coleta, the especially preferred character of Fuertes, takes notes and writes in a sort of diary as a reflection of her literary vocation, as profession, beyond the pane lucrando, identifiable in compositions of the writer such as “Sé que ya puedo seguir viviendo como poeta” (I know that I can keep living as a poet), “Poética” (Poetic) (“Dicen que soy poeta.”) (“They say I am a poet”), a publication also entitled “Poética” (Poetic) (“La poesía no debe ser un arma”) (“Poetry should not be a weapon”), in a wink towards the ideal “la poesía es un arma cargada de futuro” (Poetry is a weapon loaded with future) by Gabriel Celaya and finally “Nací con dos” (I was born with two) (“Nací con dos vocaciones: / Poeta y alegre.”) (“I was born with two vocations: / Poet and joyful.”) . All in all, both children’s characters evidence their desire for gradual personal fulfilment and progressive professional awakening in life, at the same time they cultivate fertile personal relationships driven, like the case of Gloria Fuertes, by their deep fondness for true friendship. A promotional picture of the author in this magazine is available in Fuertes (2017a: 100). For the specific case of Fuertes and her progressive aesthetic evolution until her last stage, additionally in compliance with the gradual change of public regarding recipients: Orive Marrero (2000) and Carratalá Teruel (2001); for others minor details with implications on the current society: Gloria Fuertes: poeta para adolescentes y jóvenes (Gloria Fuertes: poet for teenagers and youth) (https://youtu.be/Vrs9Knvsxew); retrieved on 28/02/2018. Ballesteros Aguayo, L. (2015): «El Día de la Victoria en Flechas y Pelayos», en: Garcia Galindo, J.A., Gregorio; P-P., Ludec, N.; and Meléndez Malavé, N. (Eds. ), El estatuto del acontecimiento I. Rennes: PILAR, p. 55. This aesthetic work of the writer was not paid attention to up until now regarding the state of the art due to the fact, presumably, that it was an ephemeral, functional and to an extent, simple literature, since it was targeted to children. However, in order to achieve a complete canonical recognition of this author for the contemporary literary historiography, it constitutes the initial seed or the protohistory for understanding her creative production of maturity between the literature and the image, the latter being a matter to which we dedicated a study in press. Other than that, in this paper the reader is offered a selected sample of this hybridization of codes regarding Maravillas in the figures 1-4 (Source: personal collection of Lucía Ballesteros Aguayo). For a detailed study of the characteristic of Maravillas and its evolution: Ballesteros Aguayo, L. (2016): Las revistas infantiles y juveniles del FET y de las JONS y de Acción Católica durante la posguerra española (1938-39): la prensa al servicio del adoctrinamiento del Estado franquista (Children and youth magazines of the FET y de las JONS and Acción Católica during the Spanish post-war (1938-39): the press at the service of the indoctrination of the Francoist State)(Doctorate dissertation). Even though we analyse this matter in detail in the mentioned study, in this context it is worth recalling the personal fondness of the writer for fine arts. In fact, her drawings have been preserved as well as other related aesthetic formalizations elaborated until the last beats of her professional trajectory; review: Fuertes (2017a: 58-59, 71, 120, 140-141, 265, 365, 406). CARR, R., (1999): España, de la Restauración a la democracia, 1875-1980. Barcelona: Ariel, 6ª ed., p. 200. Vázquez, J. M., (1963): La prensa infantil en España. Madrid: Doncel, pp. 9-10. The literary aspect of these publications has been analysed by Ballesteros Aguayo, L. (January, 2014): «Volad. Una propuesta de intercomunicación con la infancia». Revista ISL de la Asociación Española de Comprensión Lectora (AECL), nº 1, p. 58. In relation to Fuertes and popular culture: Benítez (1980). With ironic humour, Fuertes manifested that “I was called to be a trendsetter and ended up become a postist [N.T. : The author uses puns in Spanish ‘iba para modista y me quedé en postista’]. I didn’t want to serve anyone, perhaps all”. Regarding her influence of surrealist roots and her subsequent aesthetic modulation towards postism: “I became a surrealist for the delight of releasing the imagination from any break, until I discovered that I could write with complete freedom without being a surrealist, nor postist nor anything. And this is where my style originated”; “I was a surrealist without ever Reading any surrealist and later, apost… postist” (Fuertes, 2017a: 20, 32 and 151). Fuertes (2017a: 20). For the sociocultural context, both national and European of such hybrid formalizations between literature and image, including the comic, tebeo or graphic novel: Gubern (1974), Lorente (2000) and Meda (2007). Considering that we are interested, in a monographic manner, about the supplement Maravillas for the case mentioned herein, so to comply with discursive economy and delimitation of the present study object, we will leave the analytical study of Flechas y Pelayos for another printed paper. Etapa azul (blue period) is the name of the first period of dictatorship that was characterized by the practice of a totalitarian policy under the influence of the Italian fascism and the German nazism (in fact, colour blue refers to the colour of the uniform used by the Falange activists) and that extends until the end of the Second World War. Other than that, during that period, the dictatorship was managed by governments with a Falangist majority and military positions that established fascist-like measures, such as the law of press dated 22 April 1938. Highlighted by CHUECA, R. (1986): «FET y de las JONS. La paradójica victoria de un fascismo fracasado», en: FONTANA, J. (Ed. ): España bajo el franquismo. Barcelona: Crítica, p. 75. First article of the BOE (Spanish Official Bulletin), 24-08-1949. About the implications of censorship in the process of literary creations in times of Franco. Review the monographic publication of Creneida (Several authors: 2017). [21En efecto, la Falange desempeñó una labor esencial en la configuración mediática del régimen con especial relevancia en la estructuración de la red de periódicos del Movimiento Nacional; véase: Chueca, R., op. cit., p. 71.
 Review: Martín Martínez, A., (2000): Apuntes para una historia de los tebeos. Barcelona: Glénat, p. 99. In this coordinated action, the writer was an excellent enthusiast about drawing and illustration in general, while Soravilla was also accustomed to the art of aesthetic writing. For the concept of ekphrasis in Fuertes: Reina Ruiz (2003); regarding humour and other related techniques: Rogers (1981). Acereda (1999), Calleja (1999) and Casas (2000). Also: Gloria Fuertes recita su «Nota biográfica» (Gloria Fuertes recites her biography)(https://youtu.be/uPp3EYISXfY) as well as Autobiografía: Gloria Fuertes (Autobiography: Gloria Fuertes) (https://youtu.be/xPbnFdAIiWY); links retrieved on 28/02/2018. Fuertes (2017a: 9, 32 and 61). Fuertes (1996: 95). Regarding the relevance of autobiographical aspects in her works, the author stated: “My work, in general, is quite autobiographical. I admit I am very Self-ist. Perhaps –even– very Glorist” (Fuertes, 2017a: 32). Still with resonances among children: Cuento de Pelines y su amiga Coletas con la voz amorosa del Hada María (Short Story of Pelines and his friend Coletas with the loving voice of the Fairy María) (https://youtu.be/j32QniuboKU); retrieved on 28/02/2018. Fuertes (1975: 57 and 289). But also, with the cruel counterpoint of the human being, like a grotesque caricature, in the same collection of poems such as “Muñeca disecada” (Desiccated doll) (Fuertes, 1972: 200; 1975: 201). Regarding this poetic evolution by the writer with gradual modulation towards disappointment: Margeli (1986), Sherno (1989), McIntyre (1993) and Benson (2000). Fuertes (1981: 61). Regarding her relationship with dolls, the author said: “I was my own first doll” (Fuertes, 2017a: 67).
] Said topic has recovered validity again when “Coleta la poeta”(Coleta poet) was included in a recent anthology of short stories coordinated by Jorge de Cascante and illustrated by Marta Altés (Fuertes: 2017b); also for its current dissemination: Luna leyendo «Coleta la poeta de Gloria Fuertes» (https://youtu.be/AnR7IlXvFO8); retrieved on 28/02/2018. Regarding the current persistence: Coleta payasa (Coleta clown) (https://youtu.be/aD7uzGPF8V4); retrieved on 28/02/2018. For further recent formalizations of Coleta’s character, mainly in Cuento en Cuentro, inspired by Fuertes: Presentación de Coleta (Introduction of Coleta)(https://youtu.be/kjygfgZId00), Coleta Actriz (Coleta actress) (https://youtu.be/p7wnu3xd0LU), Coleta niñera y periodista (Coleta babysitter and journalist) (https://youtu.be/eOsS2LicaB0) and Coleta y los 7 burritos (Coleta and the 7 donkeys) (https://youtu.be/OLRvYW4d4P4); links retrieved on 28/02/2018. Regarding this re-writing process, there are no significant editorial variants for the study object dealt with herein. For the validity of this archetype in current society: Pippi Calzaslargas (Pippi Longstocking) (https://youtu.be/gAg4-STLDN4); retrieved on 28/02/2018. and even an “animal” of performative scenario, being up to Lola Flores, this is perhaps like Fuertes due to her fame and renown nature among children. As analysed thoroughly in our press study. For this concept of interdisciplinary art of Fuertes: Vázquez Sánchez (2004). Fuertes (1981: 84, 284 y 313; 1996: 102). With Celaya our writer spent peaceful literary evenings, together with José Manuel Caballero Bonald, José Agustín Goytisolo or Manuel Vázquez Montalbán, at her house of Chozas de la Sierra, being back then the sentimental partner of Phyllis, evoked by José Hierro in “Hablo con Gloria Fuertes frente al Washington Bridge” (Talking to Gloria Fuertes in front of Washington Bridge) (Fuertes, 2017a: 24 and 244-245); also: Gloria Fuertes en Tertulias de autor con José Hierro y M. López Azorín (https://youtu.be/gq2Z_oXuMv0); retrieved on 28/02/2018. Acereda, A., “Autobiografía y sentido en el mundo poético de Gloria Fuertes”, Letras Femeninas, 25 (1999), pp. 155-172. - “La poesía de Gloria Fuertes. Temas y contextos”. Introducción a Cómo atar los bigotes del tigre, Madrid, Torremozas (2002a), pp. 9-30. Autores varios, Creneida, 5 (2017). La censura en tiempos de Franco. Ballesteros Aguayo, L. (enero, 2014): «Volad. Una propuesta de intercomunicación con la infancia». Revista ISL de la Asociación Española de Comprensión Lectora (AECL), nº 1, pp. 57-63. (2016): Las revistas infantiles y juveniles del FET y de las JONS y de Acción Católica durante la posguerra española (1938-39): la prensa al servicio del adoctrinamiento del Estado franquista (Tesis doctoral). Benítez, R., “El maravilloso retablo popular de Gloria Fuertes”, Mester, 9.1 (1980), pp. 21-33. Benson, D., “La voz inconfundible de Gloria Fuertes, 1918-1988: poesía temprana”, Hispania, 83 (2000), pp. 210-221. Calleja, S., “Gloria Fuertes, una vida en versos”, Zurgai, s/n (1999), p. 40-42. Carratalá Teruel, F., “Gloria Fuertes para los más pequeños. Una experiencia de aula de incitación a la lectura”, Lazarillo (2001), 5, pp. 76-80. Casas, A., “La función autopoética y el problema de la productividad histórica”, en Romera y Gutiérrez Carbajo (eds. ), Poesía historiográfica y (auto)biográfica (1975-1999), Madrid, Visor, 2000, pp. 209-218. Fuertes, Gloria, Canciones para niños, Madrid, Escuela Española, 1952. Fuertes, Gloria Villancicos,Madrid, Magisterio Español, 1954. Fuertes, Gloria Antología poética: 1950-1969, prólogo y selección de Francisco Induráin, Esplugas de Llobregat, Plaza & Janés, 1972, 2.ª ed. Fuertes, Gloria Obras incompletas, edición de la autora, Madrid, Cátedra, 1975. Fuertes, Gloria Tres tigres con trigo,Madrid, Yubarta, 1979. Fuertes, Gloria Historia de Gloria (amor, humor y desamor); edición de Pablo González Rodas, Madrid, Cátedra, 1981, 3.ª ed. Fuertes, Gloria Coleta, la poeta, Valladolid, Miñón, 1982, con ilustraciones de Ulises Wensell. Fuertes, Gloria Coleta, payasa ¿qué pasa?, Valladolid, Miñón, 1983, con ilustraciones de Ulises Wensell, con reimpresión de 1985. Fuertes, Gloria Pelines,Barcelona, Miñón, 1986. Fuertes, Gloria Mujer de verso en pecho, prólogo de Francisco Nieva, Madrid, Cátedra, 1996, 3.ª ed. Fuertes, Gloria. El libro de Gloria Fuertes: antología de poemas y vida, edición y textos de Jorge de Cascante, Madrid, Blackie Books, 2017a. Fuertes, Gloria El Libro de Gloria Fuertes para niñas y niños, ed. de Jorge de Cascante con ilustraciones de Marta Altés, Madrid, Blackie Books, 2017b. Carr, R. (1999): España, de la Restauración a la democracia, 1875-1980. Barcelona: Ariel, 6ª ed. Chivelet, M. (2009): La prensa infantil en España. Desde el siglo XVIII hasta nuestros días. Madrid: Fundación SM. ChuecA, R. (1986): «FET y de las JONS. La paradójica victoria de un fascismo fracasado», en: FONTANA, J. (Ed. ): España bajo el franquismo. Barcelona: Crítica. ¿pp.? Gubern, R., El lenguaje de los cómics, Barcelona, Península, 1974. Lorente, J. C., Los tebeos que leía Franco en la guerra civil (1936-1939), Madrid, IMPHET, 2000. Margeli, M.ª P., El lenguaje poético de Gloria Fuertes, Barcelona, Universidad de Barcelona / Delegación de Tarragona, 1986. Martín Martínez, A. (2000): Apuntes para una historia de los tebeos. Barcelona: Glénat. Tesis doctoral. Maryland, University of Maryland, 1993. Meda, J., Stelle e strips. La stampa a fumetti italiana tra americanismo e antiamericanismo (1935-1955), Macerata, Edizionio Simple, 2007. Orive Marrero, M.ª C., “Un viaje a través de la poesía en educación infantil: de Lorca a Gloria”, Peonza, 52 (2000), pp. 19-23. Reina Ruiz, M.ª, “La otra mirada de Gloria Fuertes: Ékfrasis y poesía”, Letras Femeninas, 29.2 (2003), pp. 85-97. Rogers, T. J., “The Comic Spirit in the Poetry of Gloria Fuertes”, Perspectives in Contemporary Literatura, 7 (1981), pp. 88-97. Sánchez Brito, M. (septiembre-octubre, 1959): «La prensa infantil». Gaceta de la Prensa Española, nº 124, pp. 659 y 660. Sherno, S., “Carnival: Death and Renewal in the Poetry of Gloria Fuertes”, Modern Language Notes, 104.2 (1989), pp. 370-392. Vázquez, J. M. (1963): La prensa infantil en España. Madrid: Doncel. Vázquez Sánchez, A., “Poesía, música y teatro en la obra de Gloria Fuertes”, Primeras noticias. Literatura Infantil y Juvenil, 206 (2004), pp. 19-22. Paper received on 11 December. Acepted on 13 February.